1) The US was the world leader in education for over a hundred years (e.g. the High School Movement and the GI Bill). This played a major role in making the US the leading economy of the 20th century. 2) Progress in education has stagnated in the US over the last 35 years and they have now fallen behind other advanced countries. 3) The modern economy increasingly demands more highly educated workers. Combined with 2), this has led to greater income inequality in the US, as people without advanced education have fallen behind. This made me curious about how the Canadian situation compares to the US. I'm happy to say that the news is mostly pretty good. We continue to make great strides in education in Canada and especially in Newfoundland. To begin with, high school graduation rates have improved remarkably in the last 20 years; the Canadian high school dropout rate has been cut in half. 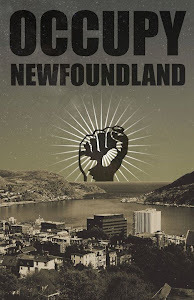 Progress in Newfoundland has been even more impressive. 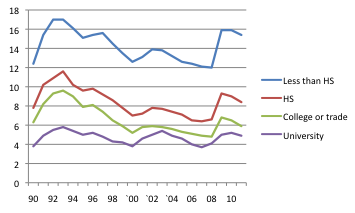 In 90-93 we had the highest drop out rate in Canada at 19.9%. 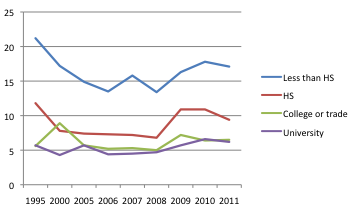 In 07-10 we had the second lowest rate among provinces at 7.4%. 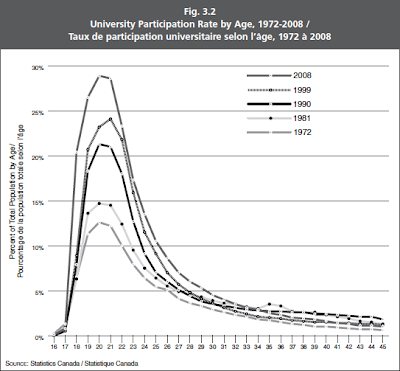 Participation in post-secondary education has also been growing, though less impressively. University participation grew quickly in the 80s, slowed down in the 90s, and picked up again in the 00s. This correlates well with tuition hikes. 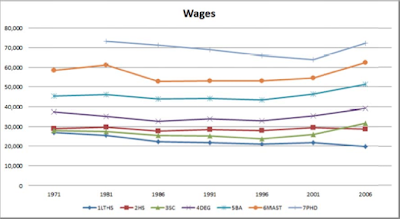 Tuition was cheap and steady in the 80s, there were big hikes in the 90s, and smaller hikes in the 00s. We explore this issue in greater depth here. 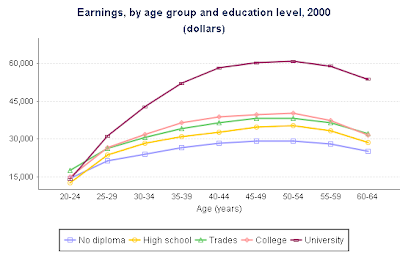 Observe that the education income premium is quite modest for people in their 20s and grows much larger with age. These income premiums have persisted and even grown over time, despite increases in education. We see incomes for high school dropouts (1) and high school graduates (2) have held pretty steady since 1986, while income for college and university graduates has been increasing since the mid 90s (4,5,6,7). This suggests that the improvements in high school graduation rates are keeping pace with demand in the economy, but that university graduation rates are falling behind demand. We can also consider unemployment rates according to education level. Evidently those with more education have less trouble finding work. Furthermore, while unemployment fluctuates with the business cycle, the overall trend in unemployment rates seems to be level or perhaps slightly down for all groups. So how do we understand this data? Education sceptics often say that education doesn't really make workers more productive, but simply correlates with the inherent ability of workers: it is the smartest, hardest workers who are able to graduate and that is why they do better in the labour market. But if this were true, then the fact that high school dropout rates have fallen so much in recent years means that employment prospects for dropouts should be dropping. After all, it is only the least employable workers who still can't manage to graduate right? The data does not support the sceptics. There is no clear trend in unemployment rates and income for high school dropouts over the last 20 years. Nor have the prospects for high school graduates diminished as more people have graduated. This suggests that completing high school really does significantly improve the productivity of the worker "at the margin", that high school diploma is not just an empty credential, and that graduates are not simply taking work away from someone else. Similarly, rising university participation rates have not led to a drop in job prospects for university graduates by diluting the talent pool. 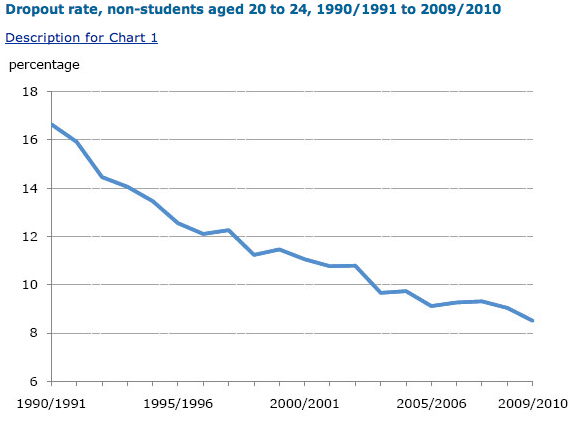 In fact, income has actually increased for university graduates since the mid-90s. This suggests that a university education confers genuine benefits and that demand for university educated workers is increasing faster than supply - perhaps as a result rising tuition costs. 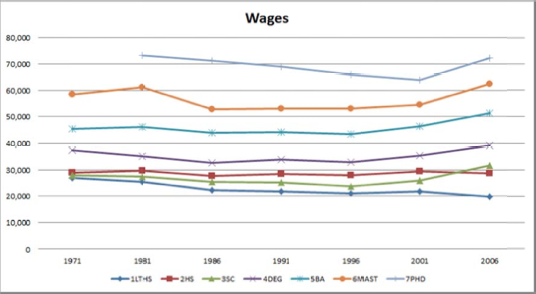 Overall, the data is consistent with the view that economic demand for a more educated workforce is growing, that education is rewarded in the labour market and leads to greater productivity, and that higher education rates benefit even those with little education due to less competition for low skill jobs. (2) income inequality among the 99%. I would argue that (1) and (2) are different issues with different causes and effects, and that education rates mainly impacts type (2) inequality because almost everyone attains some level of formal education. 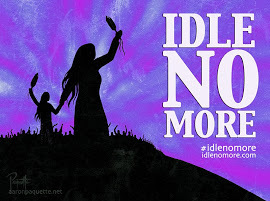 You can learn more about income inequality in Canada here. My reading of the data is that our terrific progress in improving high school graduation rates has been a big help in reducing type (2) inequality towards the lower end, but that post-secondary education participation has not kept pace with demand since the 90s and this is contributing to growing inequality between high school graduates and college/university graduates. 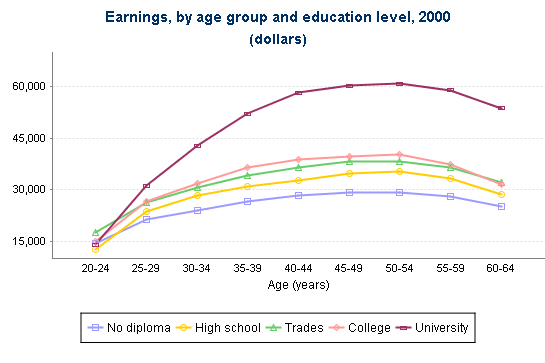 I also think that the fact that the education wage premium doesn't really emerge until a person enters their 30s provides a good argument for subsidizing university education. Young people (particularly young men) tend to discount the future and thus may pursue less than socially optimal levels of education. If cheaper tuition will encourage higher rates of participation, then this is probably for the greater good, even for those who do not benefit directly. I respectfully disagree with the previous commenter. At some point, the baby boomers will have to leave the job market and when that happens, things will change fast. There are fewer people in Gen X and Gen Y and even accounting for more women in the workforce in these younger generations, I think there will be fewer people overall competing for the same number of jobs. At that point, there will be more jobs available and they'll probably pay more as employers find they have to ante up for the best talent. Also, the economy is cyclical. At some point, austerity too shall pass. You are quite right that this is a tough time to be entering the labour market. Those with more education are having an easier time though. 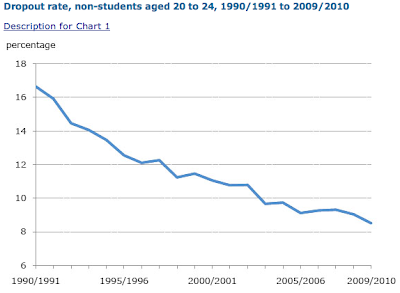 Take a look at the last graph showing "unemployment rates by education, age 25-29". Unemployment jumped much more for those with high school or less, than for those with a post-secondary degree.